This coming weekend, Segerstrom Center for the Arts in Costa Mesa will present the world premiere of the dance performance Isadora, telling the story of the famous American dance revolutionary Isadora Duncan (1877-1927), who, 100 years ago, rejected the formality of traditional ballet. No more corsets and pointe shoes – she danced barefoot, wearing flowing tunics. Isadora at Segerstrom Center for the Arts. (L & R) Natalia Osipova as Isadora. Photos by Doug Gifford. Image courtesy Segerstrom. She became an international celebrity, and not only because of her dancing, but because of her glamour and beauty… and very colorful and dramatic personal life. When she moved to Russia in 1921, she met and fell in love with the most famous Russian poet at the time, Sergei Yesenin, who was 18 years her junior. Vladimir Dorokhin as Yesenin. Photo by Doug Gifford. Image courtesy Segerstrom. They married, and traveled to Europe and the US. However, marriage lasted only a year. Several years later, both of them were dead. Yesenin took his own life in St. Petersburg, and a couple years later, in France, Isadora’s long silk scarf got caught in the wheels of the car she was in, and broke her neck. I would expect that all that and more will be the subject of this stage performance, starring Natalia Osipova, the principal dancer of London’s Royal Ballet. Installation shot, Wendell Dayton. Blum & Poe Los Angeles. Now, my friends – if you, like me, love dance and art, be sure to visit Blum & Poe gallery in Culver City. 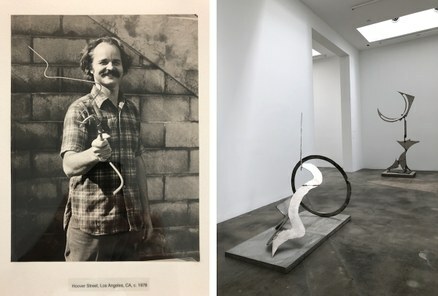 I hadn’t heard of Wendell Dayton, the Los Angeles-based sculptor, until seeing this solo exhibition spanning six decades of his career. shot of Wendell Dayton. Blum & Poe Los Angeles. Photos by Edward Goldman. 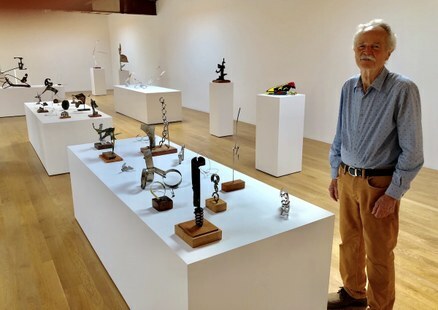 Until now, he has had neither museum or gallery solo exhibitions, which comes as a surprise considering the originality and dramatic movement and gesture expressed in his small and large-scale stainless-steel sculptures. 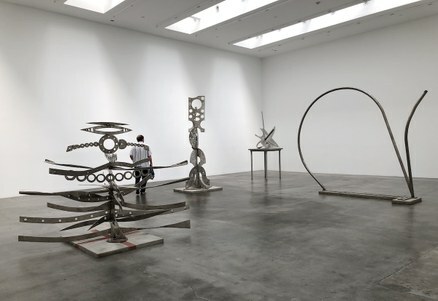 In Dayton’s art, one can see and hear the echo of David Smith, Alexander Calder, and John Chamberlain. But, what is most impressive is that Dayton found his voice and style early on. Yet, despite a 60-year-long career, his works avoid repetitiveness and continue to come across as edgy and eye- catching. Wendell Dayton with his work at Blum & Poe Los Angeles. I had the good luck to meet the artist and talk to him about masculinity and femininity in his work. I told him that looking at his sculptures, with their aggressive and lyrical gestures, made me think about dancing. “Oh yes,” he responded, “I do love dance performances.” Then, learning about my Russian background, he said, “I’ve seen and enjoyed performances by Rudolph Nureyev and Mikhail Baryshnikov.” Yes – American steel sculptures influenced by Russian dancing… how about that? 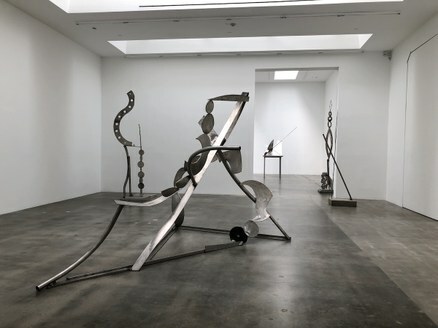 So, here we have it: Isadora dancing on the stage for three days this weekend only, and Wendell Dayton’s stainless-steel sculptures dancing at Blum & Poe until August 18.